South of Nassau, Exuma is part of the more than 365 islands (also known as cays) in the Bahamas and is comprised of the connected islands of Great Exuma and Little Exuma. When visiting the Bahamas, a world of luxury, water sports, and land activities await. The food is delicious, the weather is ideal, and the residents are known to be welcoming to visitors. Yet, of the countless tourists that come to the Bahamas, an increasing number of them head to Exuma with a different adventure in mind – swimming with pigs. Travelers appreciate scuba diving and snorkeling with tropical fish, sea turtles and shark and eel sightings, but the pigs are now the local celebrities who have attracted visitors from different parts of the world to swim alongside them at what is lovingly referred to as Pig Beach. The experience is unlike anything else, explaining why megastars and major networks tend to favor this adventure. These adorable piggies have been featured on The Bachelor, swam with supermodels, and are the focus of The Swimming Pigs documentary that has been featured in 5 film festivals. Also, the Secrets of Pig Beach is a children’s book based on these fascinating animals. Big Major Cay is the uninhabited island that the pigs call home. It remains a mystery as to how the pigs found their way to Big Major Cay. While the island is not their native land of origin, they are healthy and thriving because of the accommodations offered by the natural environment and the love of tourists who encounter them – and, of course, this love involves food. Along with the fun and excitement of swimming and interacting with the pigs, you can enjoy a serene and relaxing excursion amidst the idyllic shores and emerald waters of the beach. Just don’t forget to take a selfie! Selfie time! Be ready for a photo op that will keep your followers and friends talking by taking a picture with the pigs. 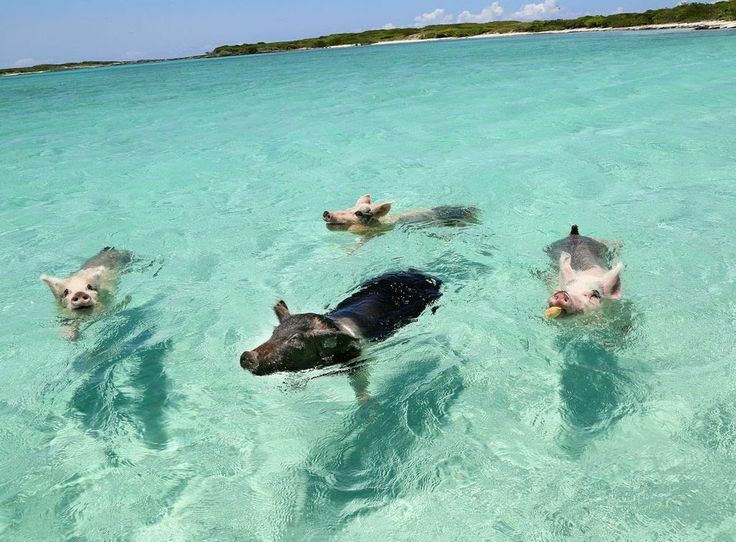 These images continue to amuse viewers as swimming with pigs in Exuma steadily grows in popularity. The #PiggieSelfie movement stands out as an exciting way to display your jaunt with such lovable creatures on a stunning beach.